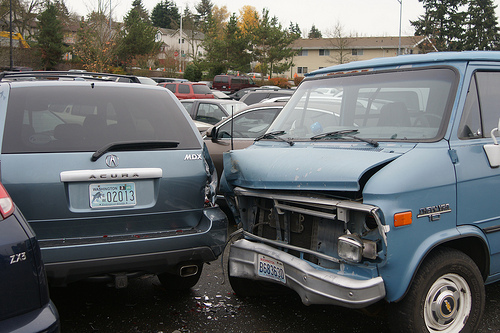 (PRLEAP.COM) Following an accident, van owners can expect a "tortuous" process to work through the claim details, which is necessary to recover their losses. Regrettably, though many van owners find the write-off valuation is very low and is inadequate to cover outstanding finance and/or the funds necessary to buy a suitable replacement. We spoke to a business offering an alternative to accepting the insurance company valuation who offer a broken van buying service. We Buy Broken Vans, as the name suggests, provide a broken van buying service, this operates across the UK mainland. We interviewed Lee Dennis, Founder and Director of We Buy Broken Vans to discuss their alternative solution to accepting the insurance company write-off valuation. We asked Lee, "So, how bad is the problem of insurance company valuations being too low for insurance write-off vans?" Lee replied "The problem is at epidemic levels and has been for a long time. We should know as we receive calls every week from disgruntled van owners, who are unhappy with the valuation given to them for their written off vans. The problem is infact so widespread that the Financial Ombudsman has even written some advice and guidance recently about what to do if you own a vehicle and your write-off offer is too low." We asked Lee, "Can you explain the insurance categories to us?" Lee replied, "Yes, sure. We regularly buy the old insurance write-off categories (C&D), as well as the new categories (N&S). We would advise any owner of a faulty van, which has been written off to obtain a FREE valuation for their van through our online valuation tool. Lee went on to discuss how van owners can expect to receive a higher valuation than through insurance companies, "In 95%+ of cases, We Buy Broken Vans pay more than the insurance company offers. Rarely from our experience, do insurance companies offer a "fair and competitive" write-off value initially. Sometimes, van owners receive a better offer if they complain, but not always! Owners of broken vans can get a free valuation without even contacting us. Owners just enter the van details, as well as all the faults, which have led to the van being written off. We supply a valuation online, this only takes 2-3 minutes and the valuation is guaranteed for seven days. When van owners also factor in that with us, they will receive their money directly into their account or via PayPal typically within 3 days, they will surely think they are onto a winning deal." We Buy Broken Vans provide a UK-mainland wide broken van buying service from their Wythall, West Midlands base. The Directors were away that owners of faulty vans were struggling to get a fair deal, either when selling to insurance companies or selling privately. They decided to set-up their own faulty van buying service, the business has grown rapidly since it was established. Trading mainly through their website, We Buy Broken Vans offer a free online valuation for all vans, which takes just 2-3 minutes to complete. Van owners can enjoy the convenience of their van being collected from anywhere within the mainland UK, which is especially ideal if the van is a non-runner. Why not call them if you have a faulty van and try the service for yourself?